The facing comic depicts Racer and his dad going to Guatemala to inspect sample cores brought up from ocean drilling. It begins with them choosing suitcases. I think they’re shopping – most people don’t have shelves full of luggage rather than books – but as we only get a glimpse of a fraction of what might be a sales lady, it’s hard to tell. She and the back of an elderly woman’s head on the plane are the only women. We spend so long in airplanes and helicopters that we’re out of room for anything but greetings when we finally arrive at the drilling platform. I think it’s supposed to get us all pumped about learning about the earth’s insides, but it just makes me reflect on the absurdity of people who don’t know how to do science zooming around self-importantly on sophisticated aircraft, using expensive equipment to pretend they’re actually scientists. The vocabulary words are slightly more on-topic this go-round. I didn’t see anything overtly religious. I do wonder what “toxic goiter” and “ulcer” have got to do with the earth sciences, but I suppose we’ll find out. Right, then: onward to the Foundations of the World. At the present rate of sedimentation (the settling of sediment), about four thousand years would be required to deposit the amount of sediment found today on the ocean’s floor. This means that sediment began to be deposited onto a clean ocean floor just after the Flood and has been building up ever since. No, Mr. Hwē‘ lər, it has not. In fact, let’s have a look at what we really discovered when actual scientists drilled into the ocean floor in the Guatemala Basin, about where this book places its fictional pseudoscientists. Hmmm. Ocean crust formed 11-13 million years ago at the Galapagos hotspot… 446 meters of pelagic sediment on to of the crust, which dates from the late Miocene to the Pleistocene, which is only about, oh, from 11 million to 2 million years ago. Never mind there’s no uniform rate of sedimentation across the entire ocean: the data in this location alone leaves them dead in the water. This is one of those things creationists have to lie about. 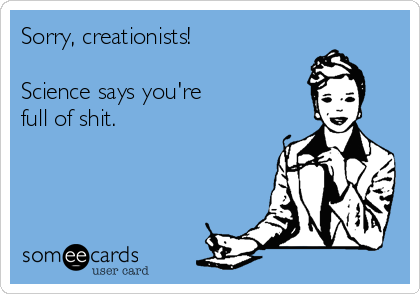 If the ocean floors have ancient sediments upon them, the Flood didn’t happen and creationism fails. Ergo, when they drill up cores of deep-sea sediments, they assume they’re all post-Flood no matter what eleventy-billion other lines of evidence say. And this, kids, is why we shouldn’t let creationists play with expensive scientific equipment. They stay reasonably close to the realm of fact when discussing the thickness of the crust. They give a mostly-okay – if terribly over-simplified – description of the Moho, and really, it might’ve been nice if they’d graced Mr. Andrija Mohorovičić‘s name with the proper accent marks. And saying he’s from Yugoslavia when it’s more like he was from Croatia is a bit silly, but these things haven’t been revised since seven years after the Cold War ended and Yugoslavia broke up, so okay. Which is why, he sez, thoroughly investigating the earth’s foundations is impossible. Yep. Because God. And these people are allowed to operate heavy machinery. Lord, have mercy. I begin to see why Jonny was promising me such fundalicious fuckery. I also see they’re on about volcanoes next, with a special focus on Mount St. Helens. Spoiler alert: it’s drastically wrong. We’ll take this PACE slowly, then, with frequent pauses to replenish our outraged howling reserves. * Yes, they thought it necessary to tell 8th graders how to pronounce “wheeler.” It’s that bloody sad.